Do you want to add meaning or purpose to your life? Would you like to travel the world, or even to other planes of existence? How about extensive training along with a chance for paid college tuition? How does a really cool tattoo sound? You just might be the kind of person we're looking for. Join the ranks of the Brotherhood of the Celestial Torch - better known as Demon Hunters! Brotherhood agents fight on behalf of Heaven to battle the forces of Hell. Demonically possessed pro-wrestlers, savage were-aardvarks, and trash-talking Eurochic vampires are all out there, waiting for a righteous smack-down. An evil organization, sponsored by satanic forces, actively seeks to quench the fires of goodness in the world. They are known as the order of the Infernal Sceptre. An important part of Brotherhood training is Tabletop Combat Simulations. 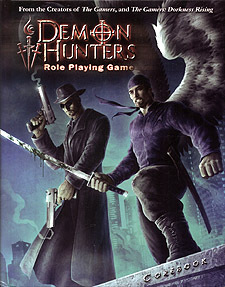 You and your friends can take part in a Demon Hunters mission from the safety of your home, bar, or yoghurt stand. All the rules, characters, and adventure guidelines are contained in this hefty tome, together with a DVD packed with additional training material and digital resources. Unlimited access to tabletop training scenarios is yours - just bring dice, friends, and your imagination! The wisdom and experience gained may one day save your life in the field. Good luck!